Over the years, Friendly Center has both grown to meet the needs of the community and, in many ways, remained true to its original principles. After all, Friendly Center is the oldest non-profit in Orange County to remain consistent with its mission since founding. This is evident today in the many Friendly Center programs that reflect groundwork laid over the past 95 years. Today, Friendly Center offers free classes to the community including parenting classes, children support groups, and English as a Second Language courses. These enrichment classes give the community tools for self-betterment and access to resources that could otherwise be out of reach. For this reason, Friendly Center’s classes provide childcare and translation. Friendly Center Placentia has recently started a job development class, which will likely extend to more Friendly Center sites in the next few months. The community enrichment classes offered today were present in the agency’s past as well. In Friendly Center’s first 25 years, the organization served as a community center on weekdays. There, Public Health nurses would hold health clinics and classes in child care. The Orange Unified School District even used Friendly Center for Citizenship classes as well as classes in sewing, cooking, and English. 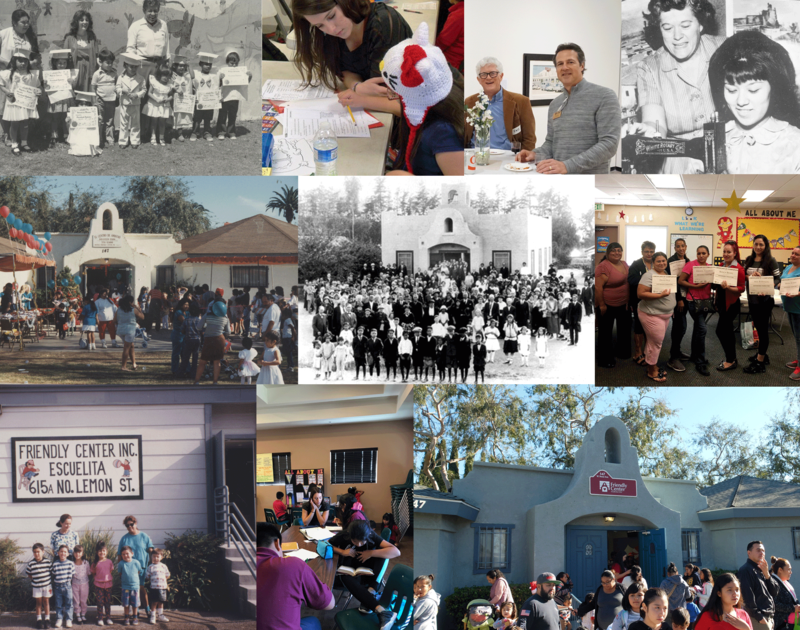 The Friends of Friendly Center go back over 50 years, when, in 1965, a diverse group of 100 Orange community members formed the group to help Friendly Center transition to an independent, community supported, non-profit organization. Today, Friends of Friendly Center is an exclusive group of Friendly Center supporters who give over $1,000 to the organization annually. As Friends of Friendly Center, members gather a few times a year to learn more about new projects and current programs while networking with fellow members with a similar passion for ending generational poverty in Orange County. Not only do these members continue to make the mission of Friendly Center achievable today, they also serve as a symbol of what is possible when a community comes together to lift up neighbors in need. Friendly Center’s education program serves a particularly imperative role in the organization’s mission of keeping children safe, stable, and secure. In 1975, a formal bilingual pre-school program began at Friendly Center for children ages 3 to 5. The program’s pre-school students were primarily from low income, non-English speaking families. The program’s main goal was to prepare children for a confident entrance into the public-school system by helping them become comfortable in English and learn basic academic concepts. In the late nineties, under the direction of Friendly Center’s then and current Executive Director, Cathy Seelig, an after-school program was established. At the time, the program served around 20 students. As the program evolved, computer donations gave the students a way to keep up with their peers and frequent field trips allowed for cultural enrichment. Today, Friendly Center’s elaborate education program serves over 100 students through after-school tutoring in three Friendly Center locations in Orange and Placentia. The current program still serves low income families with a focus on helping students complete homework assignments and engage in STEAM (Science, Technology, Engineering, and Math) curriculum. Since the 1970s, Friendly Center has made it a priority to support seniors in the community. In 1978, Friendly Center established a senior lunch program that served mostly homebound seniors, providing lunch meals on a frequent basis while simultaneously giving the seniors social interaction. Today, both Friendly Center sites in Orange continue this legacy by providing food distribution events every month specifically for senior community members. Senior Food, as the program is referred to, allows seniors access to fresh fruits, vegetables, and other nutritiously dense items. Friendly Center’s success throughout the past 95 years is thanks to those who have committed to supporting its mission through donations and volunteering over the years. Whether it be our dedicated board of director members, the 650+ volunteers who participate annually, Friends of Friendly Center members, corporate sponsors, or food drive donors – the collective passion, from generation to generation, for helping our neighbors in need has prevailed. And the mission continues – help us celebrate this milestone and honor the groundwork laid by thousands of our neighbors, past and present, by helping us reach our 95th anniversary goal of raising $10,000 for our programs.